The Peerless Power of Comics! : Clash Of The Titans! As often as Prince Namor, the Sub-Mariner, has chafed at being summoned by Dr. Strange to accompany the Defenders on a mission, it's ironic that he finds himself in the driver's seat when, ten months before the fact, he finds cause to assemble an alliance of the very characters who would become the nucleus of that non-team. But before these powerful beings can accomplish their goal, they'll be tested in battle against not only the army of an island fortress, but also the mighty Avengers! 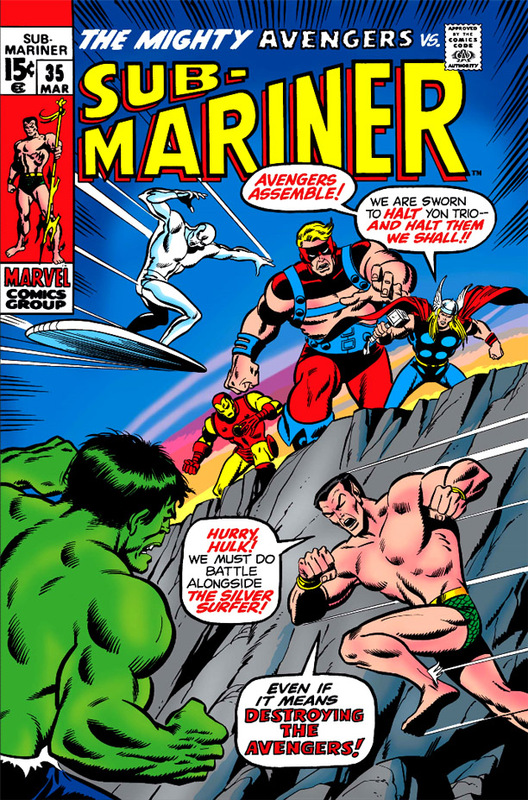 The story, crafted by Roy Thomas, Sal Buscema and Jim Mooney, comes just before the wedding day of Namor and his betrothed, the lady Dorma--a whirlwind engagement if ever there was one, Namor's proposal having been made only one issue prior. Still, as the saying goes, these two have been headed down the aisle a long time--but a crisis has arisen that won't be delayed for nuptials. 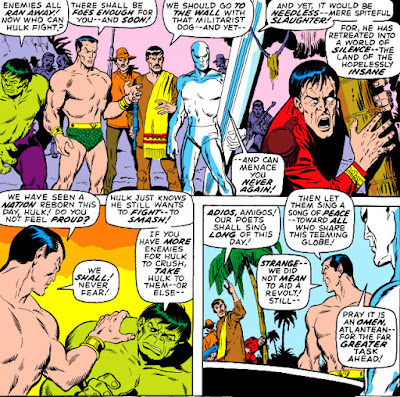 Namor and his chief scientist, Ikthon, have learned of an imminent test involving a nuclear-powered device designed to control the weather, an ambitious project under the oversight of the United Nations and based on an island in the Caribbean. It's Ikthon's belief that the apparatus isn't yet capable of being operated at full power, and that more research is needed to perfect it--and it's Namor's intent to approach those on the base from a position of strength and halt the device's activation. Yet it's a curious grouping that Namor has chosen for a mission with peaceful intentions. As he's noted, the Hulk, a loose cannon by any measure, has little patience for the ways of reason--while the Surfer has become persona non grata throughout the world, evoking feelings of distrust and hostility from the armed forces of the U.S. and other nations despite having the best intentions. Along with Namor, who himself has lashed out against the human race more than once, these three would almost certainly appear provocative to the U.N. troops stationed at the facility--or, at the very least, suspected of having the intent of sabotage. 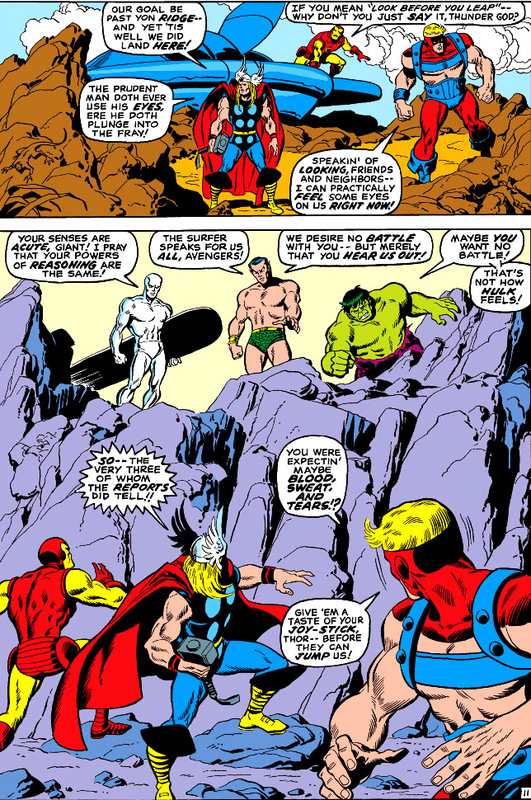 Indeed, even in their initial meeting, Namor is forced to battle the Surfer just to be heard--and if you believe the Hulk will be any more approachable, I have some weather control equipment I'd like to sell you. The Hulk has chosen to hide out on the island of San Pablo, where a dictator named (what else?) el General holds the reins of power and suppresses the freedom of its people. We have the trigger happy el General to thank for cementing the alliance of the Defenders the Titans--for when he sics his army and air force on the intruders (quite a well-fortified place, this "small" island of San Pablo), Namor convinces the Hulk that it's the humans who are his enemy, not the Surfer and himself--and soon, once they've softened up el General's forces (translation: annihilated them), the people of San Pablo use the opportunity to openly rebel and send his troops packing. Not a bad piece of work for these three, their first time out of the gate. From there, it's on to the Caribbean--where the Hulk, despite Namor ruling out the use of force, decides to take his own approach in dealing with the U.N. forces, to the alarm of his new allies. Namor obviously needs a refresher course in Diplomacy 101--for instance, it makes little sense to lead with "There is no time for words!" when you've explicitly come to explain your reasons for wanting this device to be shut down. With Namor's insistence without elaboration, how can Colonel Willis take Namor's arrival as anything other than an incursion, with the apparent purpose of landing Atlantean scientists to probe the device's secrets? Admittedly, Willis is no better--taking a hard-nosed approach with Namor and choosing to lay down the law rather than insist on a more detailed explanation. 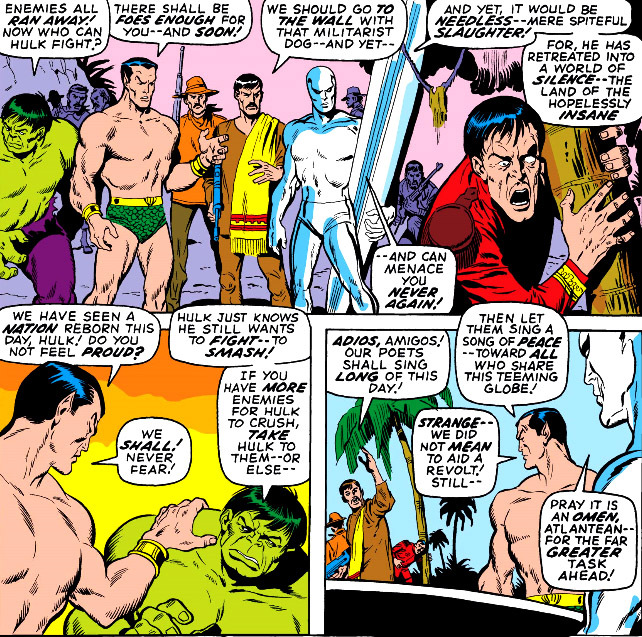 Consequently, Namor directs the Surfer to disarm Willis's men, prompting Willis to fall back and relocate his troops to the next island where he makes contact with the U.N. and advises them of the situation. Judging by the issue's cover, you can likely guess who the next call is going to be placed to. With Ikthon and his team presumably now in control of the device (and likely having shut it down), perhaps Namor will be more forthcoming with the Avengers now that there's time to go into the details of his presence here. Maybe there's also time for him to consider why he would bring along a brute as volatile as the Hulk for a mission which depended on calm and reason to win the day. Think of it from the Hulk's perspective: selected for his vast might, but held back and told repeatedly he mustn't use it. You'd think that would lead to a lot of frustration building inside him, wouldn't you? And what's the likelihood that frustration and anger would spike at seeing a group of Avengers arriving to put a halt to their activities here? About as unlikely as Namor or anyone else keeping a lid on this situation. The pair-offs here are as you'd expect, though it would be interesting to see different match-ups. 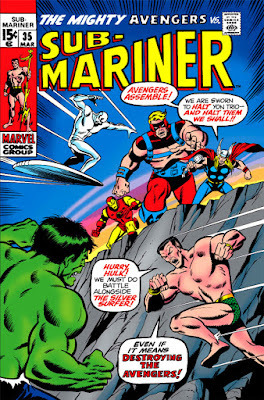 I see Thor being more of an opponent for the Surfer than I do Iron Man, while another Iron Man/Sub-Mariner clash is just what the doctor ordered. The odd man out is Goliath--no matter who you put him up against, he's in trouble. 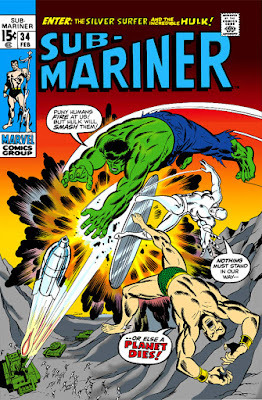 Goliath would be just one big target for the soaring, speeding Surfer--and either the Hulk or Namor have him outmatched in strength, with both having the ability to outmaneuver him. 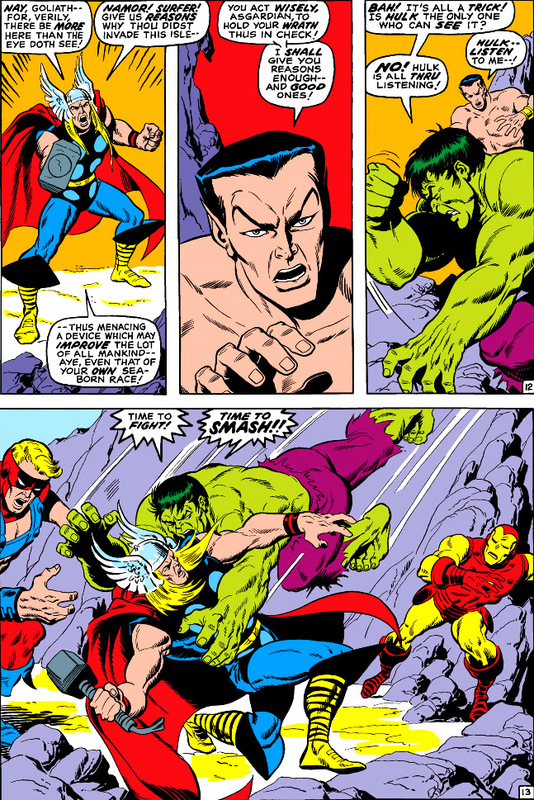 Yet having only about a little over five pages to deal in each fight satisfactorily, Buscema handles each skirmish with his usual skill, and it's doubtful anyone could complain about the dazzling if limited battle scenes that unfold. Meanwhile, on the ground, the lady Dorma has bravely put herself between Ikthon and the returned troops of Col. Willis which had opened fire on the Atlanteans--pleading for the time they need and offering assurances that they act for the good of all. Willis, to his credit, orders a cease-fire--and soon, Ikthon has a guard summon everyone within hearing to the site for the moment of truth. Regardless of the parting words from both the Hulk and the Surfer, it was a fair debut of these three very unlikely teammates--and though Thomas would be leaving Sub-Mariner in just a few issues, he would revisit the concept before year's end by drafting two of the three "Titans" into The Defenders, a new grouping that also featured the return of Dr. Strange. As for the U.N. project, it appears they tabled the weather control initiative indefinitely, though word has it they floated Ikthon one hell of an offer. 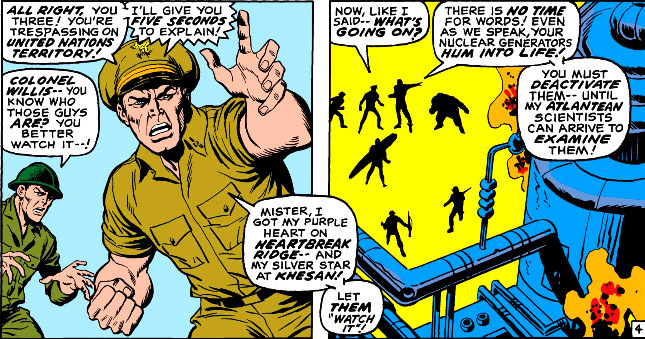 This tale points out the Clint Barton Goliath's major flaw...he was amazingly-inept. Unlike Hank Pym, who (as Giant-Man/Goliath) combined brains and brawn, Clint, with his barroom-brawling style tended to get trashed almost immediately by opponents! He was far more of a "weak link" as Goliath than he ever was as Hawkeye! I agree 100%. You’d think Hank Pym would ask for his intellectual property back at some point. I can't disagree with that, Britt. Hawkeye was one of the most resourceful Avengers in the team's lineup--yet with rare exception, his battles as Goliath appear to only allow him one outlet for his power, with seemingly little recourse for other options. It wouldn't hurt for him to take a few lessons from Captain America in hand-to-hand combat (training which you'd think he would have already received)--while Pym could probably school him in dealing with a powerful, human-sized foe. And Namor's war-cry, "Imperius Rex", doesn't make any sense. He's saying "Emperor King" or "Imperial King" in Latin despite the fact that he's neither an emperor nor a king! Without having read these comics, I don't know if a reason was provided for the odd scenario. In many instances thru out Marvel history, Namor would work the problem with the Atlantean Armed Forces. The human military attached to the project would have the privilege of seeing a legion of blue, bubble-helmeted Atlantean warriors coming out of the surf followed by Namor standing atop a Giganto beast. So, a forced pressganging of two unwilling allies is...out of character, and really tactically questionable. "Saying things backwards is supposed to give them an air of nobility and gravitas..."
The Power Peerless of Comics! "The Power Peerless"?..of, er Comics? The Infra-World of Captain Omen! A Behemoth Stalks The Stars! Arrrr... I Be The True Sub-Mariner! The Final Fate of The Bride of Doom! 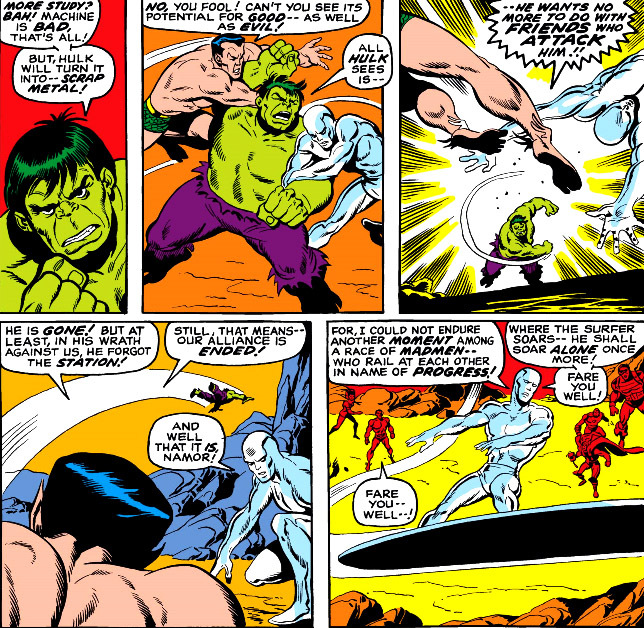 When Ambushes The Silver Surfer! Fathers, Sons, Huns... and Doc Ock! A World For The Winning!